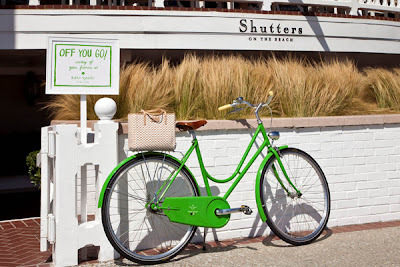 It turns out that Kate Spade has joined up with the Santa Monica hotel Shutters (I would die to stay here) to offer guests this green beach cruiser rental. For $25 a day you can sail smoothly along the warm California shoreline. Or, if you're me, you can take several tumbles and curse under your breath at the yuppie so-Cal crowd as they laugh their pants off. Hey I'd be on a green Kate Spade bike, who's the winner here? I say Good Day! That would be such a fun bike to ride around!!! i love cruisin' around the beach on my beach cruiser, perfect bike for the perfect area! It's a pretty bike and I would be proud to be cruising it on the beach! This makes me want to REPAINT my bike a beautiful kermet-the-frog-green. so cute. What a dreamy vacation! 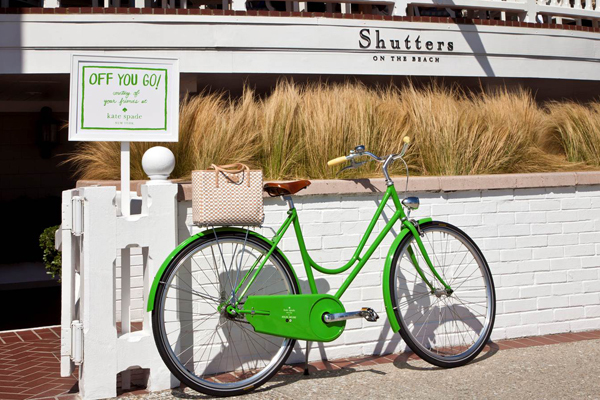 Cruising around the beach on a Kate Spade bike. Sounds perfect! I'm dreaming about exactly this vacation-how divine! Hahah. You are too funny!! I would say YOU are the winner in that situation with the awesome bike! What a cute collab! i would loove to stay there too!! i love this kelly green ride! and that hotel shutters sounds too cute!! I think we all need beach cruisers. How fun. but super cute bike, i want one!